Owl Creek Pass (Ouray County Road 8 and Forest Service Road 858) is a popular summer destination for several reasons: it’s a beautiful drive in its own right, it provides access to the Stealey Mountain Trail Complex which can be used for hiking, horseback riding, ATVs, and motorcycles, and it provides access to the Silverjack Reservoir complex. Getting to Owl Creek Pass from Ridgway, Colorado, requires a few turns. This post shows how. All photos are referenced to the GPS map above. The blue line on the map is the way there. The blue line takes you to the point where you are in the National Forest and it’s only a matter of following the road. From the corner of US Hwy 550 and Colorado Hwy 82 in Ridgway, Colorado, head north. Travel about 1.8 miles and you’ll see the sign shown below on the right hand side of the roadway. Turn right onto Ouray County Road 10. Once you make the turn, you’ll see this sign confirming your turn onto Ouray County Road 10, a graveled road that any vehicle can traverse, including 2WD passenger cars. Ouray County Road 10. If you see this sign, you're headed in the right direction. Travel east on CR 10. You’ll see the sign shown below. Bear left. Photo B. Ouray County Road 10. Bear left. Continuing, the next photo shows part of the majestic view. Those are the Cimarrons. Continue driving until you see the sign shown below. Bear left. Continue until you come to the end of County Road 10, which will be at the sign shown below. Photo D. Bear right onto Ouray County Road 8. 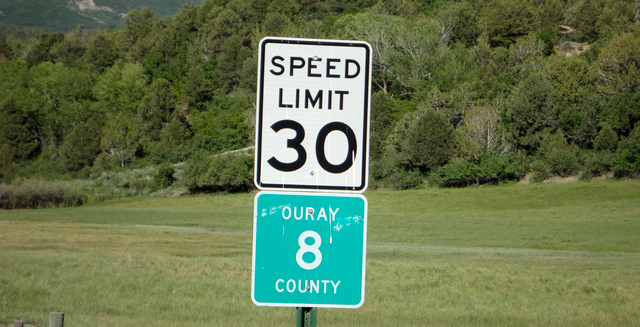 Once you have made the turn, you’ll see you’re on Ouray County Road 8. Ouray County Road 8. Continue east. As an aside, from that point you can just make out the extensive ranch building at Sleeping Indian Ranch, one of the bigger local ranches. Sleeping Indian Ranch. Huge place! Continue east. You’ll cross Cow Creek and soon come to another fork as shown below. Bear left. Photo E. Ouray County Road 8. Bear left. That’s pretty much all the directions you need. The road continues east. I put a red map pin at a location with a spectacular view back down into Millionaire Valley. Note that from this point the road is not quite as smooth, but still perfectly traversable by any vehicle when the road is dry, though you may see some minor ruts. Continue on until you cross the forest boundary, where the road becomes Forest Road 858, as shown below. Forest Service Road 858 continues Ouray County Road 8 all the way to Owl Creek Pass, which is the Ouray County Line. After that you're in Gunnison County and in the vicinity of Silverlake Reservoir. Note that Owl Creek Pass is not that high, so you’re still in the trees when you cross over. The main road down to Silverjack Reservoir, and from there down to Cimarron, can be traveled in any vehicle. Note, however, that the side roads (West Fork, Middle Fork, and East Fork) are rougher and more care is required. 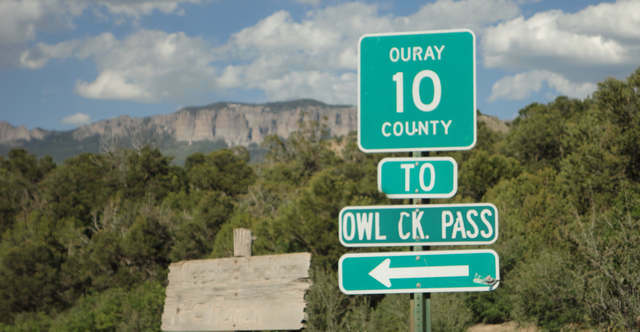 This entry was posted in GPS Tracks, Motorcycling, Ouray County and tagged Ouray County Road 10, Ouray County Road 8, owl creek pass. Bookmark the permalink. It’s several miles from Ridgway with fairly low speed limits on the gravel roads. But it’s not really far at all. Thanks for the awesome directions with photos! Planning my trip out for the fall. It looks like an easy drive. How long does it take from Ridgway?